In June 2010, the Fairmount Park Art Association launched Museum Without Walls™: AUDIO, a multi-platform, interactive audio experience for Philadelphia’s preeminent collection of public art and outdoor sculpture. This innovative program invites passersby to stop, look, listen and experience public art in a new light, through professionally produced three-minute interpretive audio segments revealing the untold histories of 51 outdoor sculptures at 35 stops along the Benjamin Franklin Parkway and Kelly Drive. The diverse narratives are told by over 100 authentic voices with personal connections to the artwork. Accessible through multiple platforms, Museum Without Walls™: AUDIO is available to the public for free on the street by cell phone by calling (215) 399-9000, mobile application, audio download, or streaming audio on the official program website at museumwithoutwallsaudio.org. The “authentic voice” narrative structure of Museum Without Walls™: AUDIO offers a fresh approach for talking about public art and reaching new audiences. Each narrative compliments the viewer’s experience of outdoor sculpture with a program that is as unique as the artwork it describes, featuring different voices, themes, and production styles, produced by award-winning public radio producers and journalists. Programs explore personal and cultural connections to the art, while offering insight into the artists and their processes, what the sculptures represent, the history surrounding the works, and why the pieces were commissioned and installed at specific sites in Philadelphia. As the nation’s first private, nonprofit organization dedicated to integrating public art and urban planning, the Fairmount Park Art Association, founded in 1872, commissions, conserves and interprets outdoor sculpture throughout Philadelphia. Public art in Philadelphia has been initiated by a wide range of individuals, organizations, and agencies. The Fairmount Park Art Association was directly involved in the acquisition and conservation of many of the 51 sculptures featured in the first phase of Museum Without Walls™: AUDIO. The Art Association plans to expand the program in the future to include more of the city’s public art. “The Museum Without Walls™: AUDIO program will provide a high quality way for more people – from tourists to residents – from art enthusiasts to recreational users – to access information and experience outdoor sculpture in an innovative, engaging, fun and meaningful way,” says Meryl Levitz, President and CEO of the Greater Philadelphia Tourism Marketing Corporation. 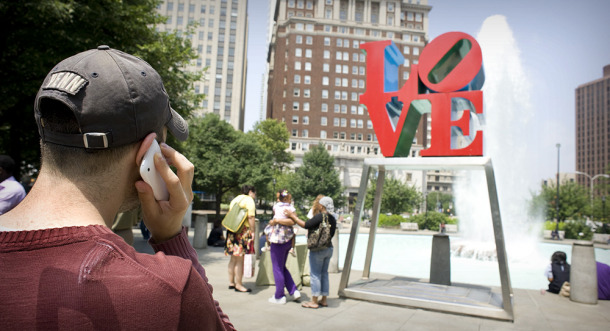 Permanent outdoor signage located at each sculpture features dialing instructions for accessing the program by cell phone by calling (215) 399-9000. The official Museum Without Walls™: AUDIO website offers online audio slideshows for all 35 audio programs, and high-quality stereo downloads of each program for use on personal iPods, MP3 players and other audio devices. An official Museum Without Walls™: AUDIO mobile application is available for use on the iPhone, Blackberry, and Android. A free map and guide is available at the Fairmount Park Welcome Center in LOVE Park and local visitor centers and nearby cultural institutions. The Museum Without Walls™: AUDIO website also promotes user-generated content, inviting Philadelphia visitors and residents to send in their own stories and submit personal photos of favorite public art works. A project of the Fairmount Park Art Association, the Museum Without Walls audio tour tells the stories behind 51 works of public art in a series of 35 stops. The project has some extremely cool technical features, but it also can be accessed by anyone capable of dialing a phone, at 215-399-9000. Philadelphia has more outdoor sculpture than any other city in the United States, says Penny Balkin Bach, the art association’s executive director. Yet even longtime residents can find something new on these three-minute audio segments. Museum without Walls will offer passersby the chance to stop; look, listen and experience public art in a new way, by accessing, through their cell phones, audio segments that reveal the untold histories of 35 outdoor sculptures along the Ben Franklin Parkway and Kelly Drive. This innovative program invites passersby to stop, look, listen and experience public art in a new light, through professionally produced three-minute interpretive audio segments revealing the untold histories of 35 outdoor sculptures along the Benjamin Franklin Parkway and Kelly Drive, along the Schuylkill River.